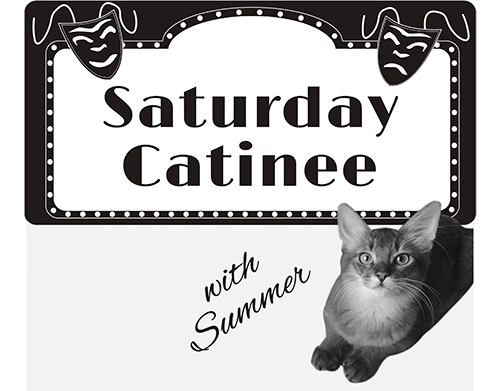 You are here: Home / Catinees / Saturday Catinee: Binga Speaks! If you follow me on Instagram, you may have seen a video of Binga meowing. This isn’t that video. 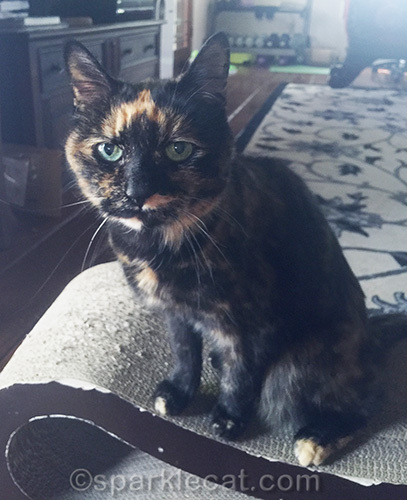 Binga talks all the time, usually about how she wants food. So my human got a couple of different videos of her meowing and then edited them together. So in addition to the meowing you might have seen on Instagram, there is a whole lot more. If your sound is already on, you don’t need to turn up your speakers! If you can’t see the above video, click here to view it on YouTube! Incidentally, the floor isn’t quite as dirty as it looks — it’s mainly just ugly, which is why we don’t do photo shoots in the kitchen very often. I guess she is not amused. Thank you, thank you! Love the talking Binga. 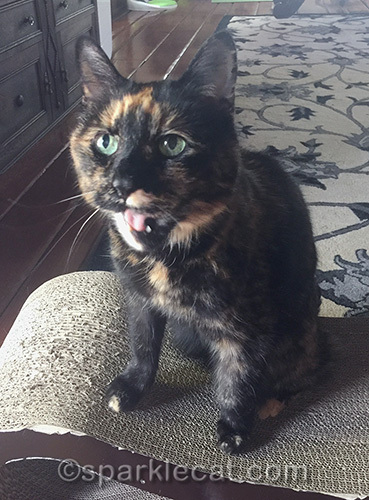 The cats were napping, just now…until Binga started yapping, hee, hee! Sneakers and Friday made a mad dash for my desk and looked at the computer once they figured out where the sound was coming from…Elvira? She looked up, watched the younger cats a minute, then returned to her nap.